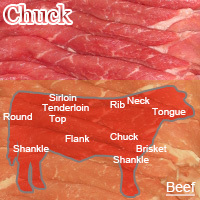 Beef chuck is located between the neck and shoulder roast of cattle. It is said to be suitable for making roast beef. However, it is not fit for making curry. Recipes sites show you how to use it to make beef stew. The calories in Beef Chuck per 100g(1cut ) is 180 calories. Beef Chuck is calculated to be 180Cal per 100 grams making 80Cal equivalent to 44.44g with 19g of mostly protein、10.6g of fat、0.1g of carbohydrates in 100g while being rich in vitamins and minerals such as Vitamin B12 and Zinc.